When it comes to income trends in Minnesota, we’ve got some good news and some bad news. The good news is that income growth in Minnesota has surpassed the national average over the last decade, both in aggregate and within every income group. The bad news is that income inequality has increased over this period, both in Minnesota and in the entire U.S.; literally, the rich have gotten richer and the poor have gotten poorer. The American Community Survey (ACS) reports median income data for the U.S. and for each state, including Minnesota. The ACS also reports mean income within six income groups, ranging from the bottom quintile (i.e., group of 20%) to the top 5%. * The 2016 income ranges for all six income groups for the United States and Minnesota are listed below. Minnesota’s 2007 median household income was $64,593, $5,859 greater than the U.S. median ($58,734). Over the course of the Great Recession and the subsequent recovery, real median income in Minnesota increased by about $1,000 to $65,599, while the U.S. median declined by about $1,000 to $57,617. By 2016, the gap between Minnesota’s median income and the U.S. median had swelled to $7,982. Minnesota’s relatively strong performance compared to the rest of the nation in income growth is evident across the entire income spectrum. In 2007, Minnesota’s mean income exceeded the national mean in all six income groups except for the top 5%. Within each of the lower five income groups, the income gap between Minnesota and the rest of the nation grew; within the top 5%, the extent to which the U.S. income level exceeded that of Minnesota shrank. While Minnesota has enjoyed relatively strong income growth during the current business cycle, that growth has not been evenly distributed among all income groups. 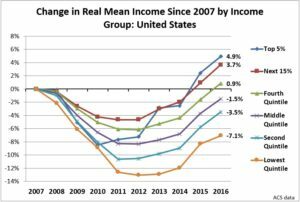 The mean income of all groups declined during the Great Recession; however, higher income households have recaptured all that they have lost and now enjoy mean incomes above pre-recession levels. Meanwhile, the bottom 40% of households still have 2016 mean incomes below the 2007 level. For example, the 2016 mean income of households earning less than $28,468 is still $436 (2.7%) below the 2007 level. 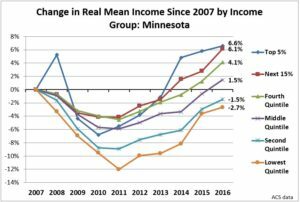 The fact that mean income has increased among higher income groups and fallen among lower income groups is proof that income inequality in Minnesota has worsened. During the current business cycle, income inequality in Minnesota has grown less rapidly than the national average. Within the entire U.S., mean incomes have fallen for the lowest 60% of households; only the top 40% have seen mean income growth from 2007 to 2016. The difference in the degree of income inequality between Minnesota and the U.S. and the growth in inequality over time can be quantified using the Gini coefficient. A Gini coefficient of 0 denotes complete equality, while a coefficient of 1 denotes complete inequality. Income inequality has increased during the current business cycle, both in Minnesota and nationally. However, Minnesota has consistently been less unequal than the rest of the U.S. and the degree of inequality in Minnesota has increased less rapidly. It is difficult to quantify the extent to which Minnesota public policy has played a role in mitigating growth in income inequality. It is worth noting that Minnesota experienced a significant drop in income inequality as measured by the Gini coefficient after enhancements to the Working Family Credit and increases in the state’s minimum wage were enacted in 2014. 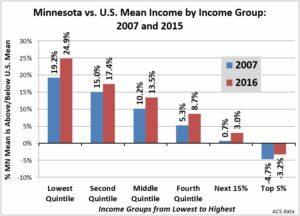 In addition, since 2014 income growth among lower-income groups in Minnesota has generally surpassed that of higher income groups; this is in stark contrast to the national trend since 2014—in which higher income groups have continued to outpace lower income groups in income growth. Growing income inequality—as epitomized by flat or declining incomes among lower- and middle-income households and rising incomes among high income households—erodes the purchasing power of working families and contributes to more severe recessions and lackluster economic recoveries. While policies in Minnesota may have helped curb growth in income inequality, policies in Wisconsin appear to have exacerbated it. More on this in part 2 of this series. *The ACS reports information for all five quintiles and for the “top 5%.” The “next 15%” (i.e., the bottom three-quarters of the fifth or highest income quintile) is calculated here based on fifth quintile and “top 5%” data. Because the ACS is based on a sample of households, ACS estimates contain a margin of error. The Minnesota estimates contain a larger margin of error than the national estimates because they are based on a smaller sample size. 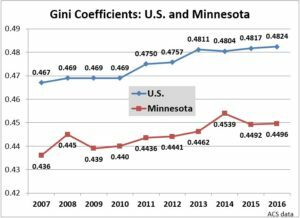 Some of the abrupt jumps in the Minnesota estimates—for example, the spike in mean income among the top 5% and the jump in the Gini coefficient in 2008—could be partially the result of sampling error. †The conversion to constant 2016 dollars is based on the Consumer Price Index.